This week’s coffee tour is a bit of a throw-back. While Zack was visiting friend in Germany last year, he had the chance to pop into Playground Coffee. Playground is housed inside Otto’s Burgers, a very popular spot for burgers, and weekend brunch. Then again, coffee was exactly what Zack was looking for. Playground’s set-up is no-frills. A quality third wave coffee shop with some playful splashes of color and chalkboard design thrown in. After all, you gotta find a bit of vintage style when you find yourself with prime real estate in a university neighborhood. The barista behind the counter was from Australia. He had vast experience and really knew his stuff. Zack thoroughly enjoyed his pour over. Playground’s coffee packaging is almost as enjoyable as its coffee. Be sure to check it out on their website. We were searching for a lunch spot to meet up with my dad and step-mom. It really was more about location than anything else. Of course, the word coffee did appear in our search criteria…Tucked away in the second floor of what was once a community bank building, Higher Grounds is not in the most prominent of locations. And yet, the customer traffic suggests that location isn’t a hindrance. A cute breakfast and lunch spot, their menu offerings were fresh, creative, and enticing. I was definitely more interested in the food options than the coffee, at least initially. But while ordering food, Zack asked the girl at the counter if they offered any sort of hand brewed coffees. She admitted her lack of coffee knowledge, but called her coworker from the back. Out from the kitchen came a young man – emphasis on young. My first thought was, ‘how can this guy know anything about coffee?’ Seriously, I’m certain I’m old enough to be his mom. And I’m not THAT old. Caleb smiled and offered to prepare a pour-over for us. We asked for a coffee recommendation. Turns out, the kid not only knows how to prepare coffee, but he also roasts his own beans. Caleb De Avila and his brother Josh got the ‘roasting bug’ after watching the Travel Channel series Dangerous Grounds. So about a year ago, they began roasting their own beans. And in the last six months, Caleb has begun doing even more. While most college kids spend their hours outside of the classroom in more traditional or conventional ways, Caleb spends the majority of that time with coffee. Whether he’s perfecting his roasting game, preparing coffee at Higher Grounds, or working at the company’s other shop 2 Ladies in the Attic, Caleb is all about the beans. On the day we visited Higher Grounds, Caleb prepared two pour-overs for us: one Ethiopian and one Brazilian. Both were quite enjoyable. His roasting skills are quite impressive, particularly given his age and the brevity of his roasting experience. And he’s also expanding his skills through experimentation with nitro cold brewed coffee. In addition to good coffee, Higher Grounds is worth a visit for the food: definitely as delicious as it looks. If you happen to be driving on I-85 just north of Gwinnett County, Georgia, take a break at exit 129. Turn one way and you’ll find Higher Grounds. Turn the other, and you’ll get to 2 Ladies in the Attic. Either way, if you happen to meet Caleb, tell him his new friends in Norway said hi! 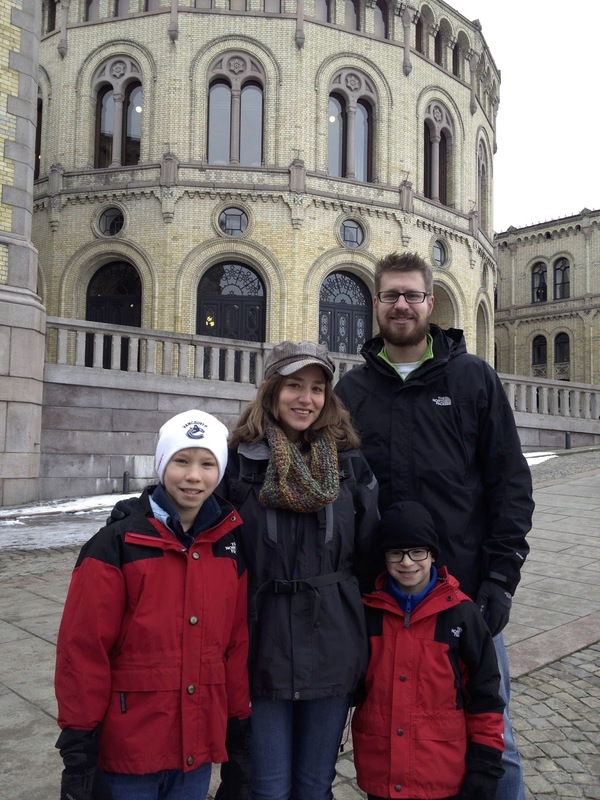 On February 1, 2013, four weary travelers arrived in Oslo. Tired, jet lagged, and quite overwhelmed, yet relieved to have made it. And ready for whatever was to come.Well, we thought we were ready. What was to come was a lot. Ups and downs. Good days and frustrating ones. But through it all, we’ve come to love living here. Happy Three Year Anniversary to us! Some claim that after extended time together, a dog and its owner begin to resemble each other. I have to admit, I’ve seen photos, and the phenomenon does seem to exist!But perhaps the same is true in the professional world. I wonder if maybe an entrepreneur or businessperson becomes more like his or her products the longer the two are together. Case in point: meet Brian Holland, founder, president, and CEO at Phoenix Roasters. It could be merely coincidence. But just a few minutes with Brian, and you’ll quickly see the similarities between the man and the coffee his company produces. Highly caffeinated at all times, or merely abounding with endless energy, Brian rarely sits still. And even when his body slows for a moment, he’s at warp-speed in conversation. But when you spend a few minutes with Brian, you also quickly discover he is a man who is passionate. Passionate about helping those who are struggling or hurting. And passionate about coffee. And what do you get when you put those passions together? Coffee that matters. It’s the theme of Phoenix Roasters, and the heart of what they do. 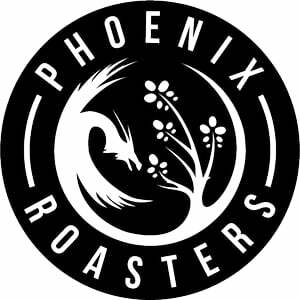 Phoenix Roasters is a coffee roasting company operating out of Duluth, Georgia, and distributing coffee throughout the United States. Phoenix Roasters operates in connection with Phoenix Community of Atlanta, which includes Sunday morning gatherings and weekday community groups taking place in various suburbs of metro Atlanta. These faith-based groups are designed as a place for encouragement, redemption, and transformation – particularly for people who are struggling or hurting. Phoenix spends time in Central America, building relationships with and training coffee growers in several countries. Through their programs, they are teaching methods for growing and cultivating high-quality coffee beans. And by paying a better-than-fair wage, the growers can also better provide for the needs of their families. Phoenix partners with such groups as the Atlanta Mission and in local prison ministries. The Phoenix team can be found throughout the US serving up #CoffeeThatMatters at national conferences like Catalyst and If: Gathering. During our recent time in Georgia, our family stopped by Phoenix’s roasting facilities a couple of times. Their warehouse space is where all of their roasting, packing, and distribution happens, and also the home to one of their Sunday morning groups. While there, we indulged in Phoenix’s new nitro coffee. Liquid energy. It’s the best way to describe this coffee concoction. A cold-brewed coffee infused with nitrogen and dispensed from a keg, it offers intense flavor and a lightning-fast caffeine jolt. And now that I’m back in Norway, I think I’m experiencing Phoenix Nitro withdrawal! What a great concept: Coffee That Matters. As they state on their website, Phoenix is all about “life transformation through the sale of excellent coffee.” It’s all part of Phoenix’s Cycle of Relief program. And it all points back to the legendary bird for whom the company is named, beautiful imagery that speaks to Brian’s passion for reaching out to those who are broken up and burned up. Our two months in America flew by, and this past Saturday we returned home to Norway. I’d hoped to blog more while in the states, but we were extremely busy and it just simply did not happen.We do, however, have several things we’ll share in the coming weeks. The Coffee Tour will kick off again this Monday, with a visit to a coffee roasting company in Duluth, Georgia. And we’ll share a bit about what we did and what it was like being back after a few years away. Hope you all had a great Christmas, and here’s to a fantastic 2016! We are definitely in countdown mode, as we prepare to go ‘home’ for the holidays!I kicked off our Saturday morning by introducing our boys to Neil Diamond. They thought I was a bit crazy, but it was fun singing America! We are about two-thirds of the way through our packing. I’m struggling a bit as I look at the forecast and see the really warm temps, knowing that we’d already packed away our summer clothes! But we’ll manage – or we’ll shop a bit! So I apologize that we aren’t totally engaged on the blog right now. We are busy finishing up things here before saying ‘see you soon’ to everyone on this side of the ocean. But we’ll be back soon, with observations on our first time back in the states as a family in more than three years! We found the location and walked down the steps, to the underground cafe. I feel quite confident that this is the strangest location we’ve visited for coffee. You would be hard-pressed to find a weirder one. If you do, please tell me. Yes, an underground cafe. But that isn’t what makes it so odd. In fact, this coffee shop had a prior life. As a urinal. No joke. This location was once a men’s public toilet – a Victorian toilet – but has been converted to a charming (albeit wacky) coffee shop. 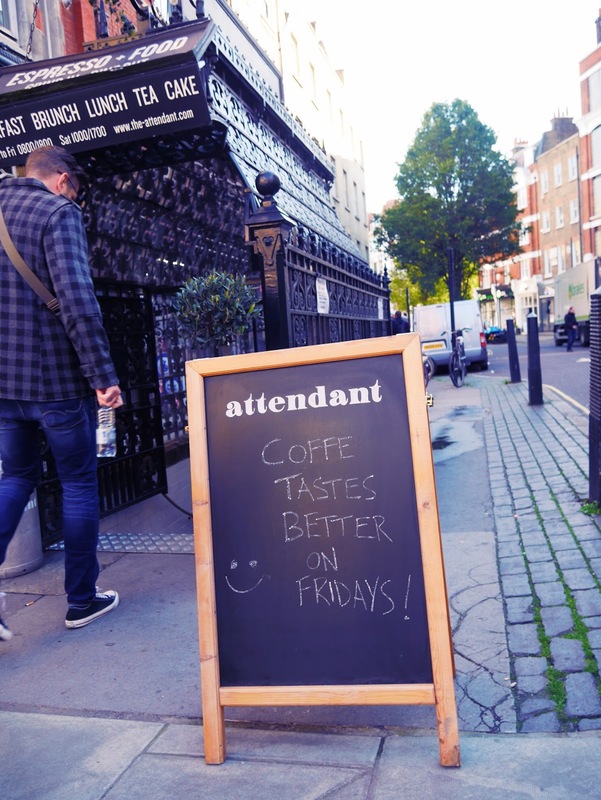 We arrived at Attendant, and my initial fear was that a place such as this would be so focused on its kitchy-ness, it would not be quite as concerned with quality coffee. But once we received our drinks, my fears subsided. Attendant has excellent coffee. I enjoyed a cortado, while Zack had a fresh-brewed coffee via AeroPress. Both were delicious, and I can say that Attendant in the Fitzrovia district of London is well worth a visit. And the only time one will feel comfortable cozying up right next to someone in a urinal, I’m sure! Milestone birthdays call for special celebrations. 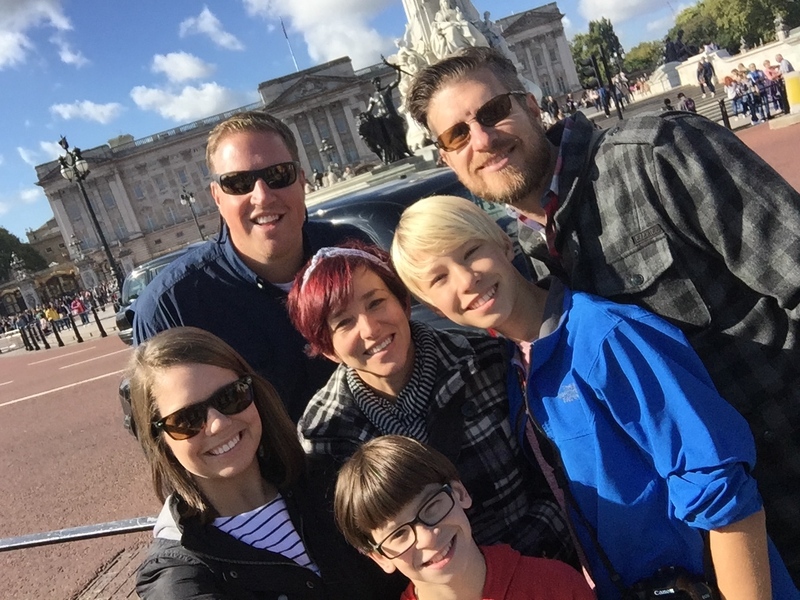 And since Zack celebrated number 40 this past month, we thought it fitting to celebrate big!We started out with a few days with his brother in sister-in-law in London, and then flew to Athens, Greece. Zack’s parents purchased concert tickets for us to see one of our faves, Zac Brown Band, in London. We spent a long weekend there and had a blast at the concert. But I think we’d all agree that the best part was spending time with Josh and Savannah! 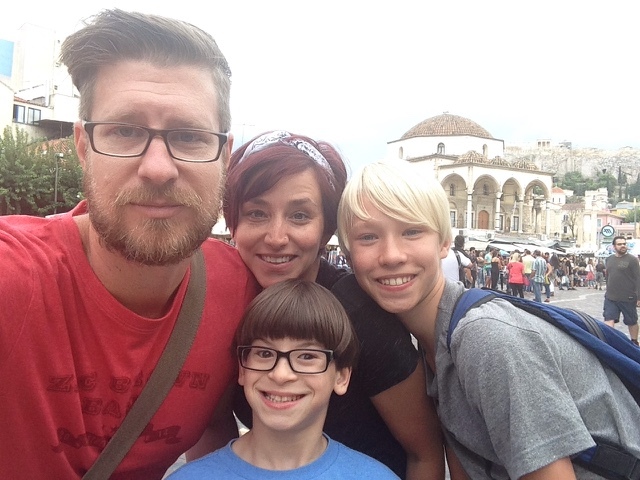 After our London weekend, we flew to Athens, Greece. This was Zack’s main birthday gift: visiting a city that has been at the top of our list for quite some time. 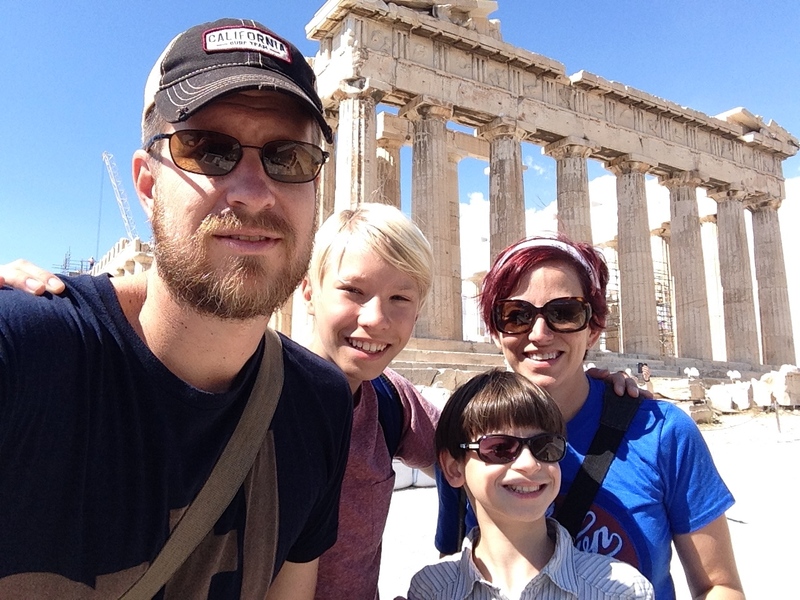 We had a great time exploring ancient sites, visiting with friends, and eating incredible food. Sometimes you visit a place because of good reviews.And sometimes it’s because of a special story. So when Zack found out he’d have a few hours in between train trips with a friend earlier this year, he decided to check it out. Coffe Baum began serving in 1694. Yeah, it’s been around awhile. The shop, as it exists today, includes coffee, food, and a museum. Zack had coffee and a slice of cake. He said he really enjoyed the cake. He and his friend also took a quick walk around the museum, before making their way back to the train station. Coffee Baum offers something special. Experience. While it probably won’t be the best cup of coffee you’ve ever had, there is something to be said for the historical experience of it all.